Private Office of His Holiness the Dalai Lama has a responsibility to clarify the reason behind the postponement/cancellation of 2016 Kalachakra initiation at Bodh Gaya. They cannot be just a mere spectator in this entire episode of Kalachakra being used as an election tool. Election Commission should monitor the social media presence of Sikyong candidates. There should be no gross negligence of EC rules. Also, EC should watch the social media to make sure no CTA or election officers participate in the electoral process via their private social media profile such as announcement of election-related information and declaration of election results. Tibetan in diaspora should move away from their public display of love and affection only for a candidate who comes from their own province or region. Recently, a few people from UTsang has resorted to unifying UTsang-pas in the wake of upcoming election. 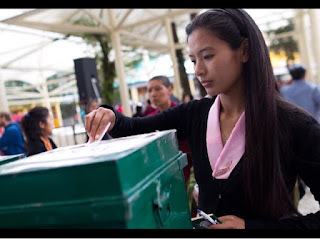 If provincialism or regionalism prevails, the future Sikyong will only be UTsang-pa. This will be a huge blow to the nascent Tibetan democracy. Individual holding public position should refrain from supporting or disapproving any candidates for Sikyong or Chitue. Current Sikyong and Speaker should not stand at the podium this coming March 10. Instead, their representative should deliver the statement. Candidates should not receive even a slight advantage because of their current position. Debate between the two Sikyong candidates is a must. The general public will always be sandwiched between two truths or two lies propagated by these two candidates. The only option is sharing a single platform to put candidates face to face. khampas are regional since 1960. it is seen as natural and their right. when U-TSANGPAS get regional it is seen as a crime, creating discord in the community. why? why this double standard?